During the week of 22 April 2013, the Argentine Congress, controlled by a Peronist majority responding to Cristina Fernández de Kirchner (known as “CFK”), passed a set of laws, after an urgent push from the Executive, whose main effect is to obliterate the independence of the judiciary and hand over the sum total of power to the Executive Branch, directly or indirectly. The United Nations Special Rapporteur on the Independence of Judges and Lawyers, Gabriela Knaul, has officially condemned the reforms as contrary to the International Covenant on Civil and Political Rights (ICCPR) adopted by the UN General Assembly in 1966 through a public statement on 29th April. Many lawyer associations, international NGOs and political parties have voiced their condemnation. Under the fallacious slogan of “democratisation of justice”, CFK government has enshrined in statute three bills that modify the “counsel of magistrates” (the body in charge of naming, sanctioning and firing judges) increasing its members from thirteen to nineteen. Twelve of the members of the new Counselwill be elected by universal suffrage and political parties will nominate the candidates. Elections for the magistrates will be held at the same time as the parliamentary and/or presidential elections. Judges will be named or fired by a simple majority within the counsel of magistrates. Judges will not necessarily be subject to any examination or merit considerations. From the entry into force of the new legislation, judges will be elected or removed from office by the same political majority that controls Congress and/or the Executive at any given time and will be elected through the political parties they represent. The second key aspect of the legislation is that judicial review of government acts on the grounds of breach of human rights, constitutional law or statute, known as “recurso de amparo”, will be considerably limited in scope and time. Given that the action of “amparo” is enshrined in article 43 of the Argentine Constitution, this legislation – many analysts argue – amounts to a constitutional reform through the back door. Worse yet, interim relief (the temporary measures a judge can dictate in order to preserve a constitutional or legal right being threatened by a government act being challenged) will be limited in duration to three months and, in many cases, excluded. Curiously, the judicial review process that will examine the validity of the act does not impose a time limitation for the judge to reach a decision on the substantive issue, which would have been the adequate remedy to counteract the mischief of never-ending challenges to government acts. Considering that, more often than not, the process of judicial review of government acts takes years to reach a decision in Argentine courts, the effect of the new legislation will be that, at the expiration of interim relief measures, the right being protected would have disappeared or been compromised, making judicial review pointless. As a dissuasive measure, it is clearly a good one. 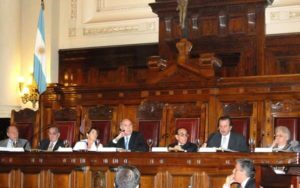 The third aspect of the reform is the installation of a four-stage judicial process by creating a new set of courts (“tribunales de casación”), which will become the third stage of judicial scrutiny, a stage currently occupied by the Supreme Court whose members are perceived as hostile by the governing majority. The keystone for understanding the introduction of the new courts is that they will be elected by a majority vote within the Counsel of Magistrates, and until the mechanisms of the new Counsel is in force, the Executive will be able to nominate interim judges to the new courts – needless to say that the Executive could delay the election of permanent judges via the Counsel of Magistrates for a considerable time. Perhaps the most serious institutional implication of the judicial reform is borne out by the fact that the governing majority will elect judges, shattering all hopes for an effective separation of powers in Argentina, principle which has been relentlessly undermined by Peronist governments since 1989, not to mention previous regimes. As Borges’ quote suggests, majority support does not necessarily entail truthfulness or fairness. Totalitarian regimes distort the nature of universal suffrage – which is a method for resolving a conflict or deciding a contest – assigning to it the ability to dictate the nature of truth or the fairness of a government decision. In order to illustrate how far from truthfulness and fairness the will of the majority may be, suffice it to recall the 85% majority support obtained by Hitler in 1934, which allowed him to become Chancellor and President of Germany; in all subsequent referenda the Nazi Party obtained between 98% and 99% majority support. That is precisely why in any constitutional democracy judges are the guardians of the rights of minorities, political parties are subject to strict laws, and checks and balances exist at all stages of government to guarantee citizens against the abuse of power. For many commentators, politicians and constitutional law experts, this reform is the last nail in the coffin of a dying Republic. Applying Montesquieu’s famous formula according to which “a society where human rights are not guaranteed, and the separation of powers is not determined, it has no constitution”, it may be contended that this judicial reform is the founding act of a new regime, a sort of Napoléon-style coup d’état leading to a dictatorship of the majority, an authoritarian populist Caesarism. Another interesting aspect of the reform is the organisation of the elections to the Counsel of Magistrates. The new set of laws determine that to be able to present candidates, a political party must have national representation in eighteen districts (provinces), without counting any possible inter-party alliances. In fact, the only party to have such representation is the governing Frente Para la Victoria (FPV). Practically all lawyer associations, independent judges and opposition parties are united in condemning the new measures as a serious assault on the Constitution and are joining arms to trigger a myriad of judicial challenges to the new laws once they are promulgated. The question remains, will judges dare rule against the government under the new regime? A gullible observer may wonder about the rationale and timing of such desperate measures by a government facing serious economic problems and growing social discontent. The answer may lie in two recent events. First, in recent rulings the Federal Court of Appeal has decided that a number of articles of the controversial “Media Law” breached the Constitution. It should be noted that the “Media Law”, as it has been nicknamed, is an act passed by Congress in 2010 – allegedly – to dismantle media monopolies, and to guarantee the independence of the press. Many would argue that the true purpose of this legislation was to silence the opposition media giant Clarín, the largest private newsgroup and television conglomerate in Argentina, an old friend of the Kirchners turned foe following a disagreement over football television rights. The enforceability of some key articles of the Media Law is currently suspended by the judiciary, which is examining their compatibility with the Constitution. Secondly, a very popular TV program conducted by Jorge Lanata – Argentina´s most revered journalist at present – revealed this month a piece of investigative journalism carried out during the last two years, unveiling a complicated network of corruption headed – it is claimed – by the late Néstor Kirchner, former president and husband of the current occupant of the Casa Rosada. These allegations have been supported by a number of private prosecutions and other journalistic works and are extremely well supported by hard evidence and witness statements. This discovery and the evidence that is emerging every day may have accelerated, many contend, the desperate attempts by CFK to control the judiciary before her term in office is over, thus ensuring all the court cases involving her administration are closed and reach final judgement (allowing a res iudicata exception which would bar any further judicial inquiry) before her opponents can lay hands on her. Regrettably, these reforms and the corruption surrounding them are not isolated events. From the beginning of their accession to power, the Kirchner couple have advanced towards a regime of concentration of powers, gradually eliminating all checks and balances, neutralising judicial scrutiny, and controlling radio stations, TV channels and newspapers through a legion of front-men. One lesson to be learnt by constitutional lawyers is that constitutions are ineffectual literary efforts where they are not underpinned by social and political consensus on the rules of the game. In this respect, the Argentine people have shown consistent disregard for institutions and the rule of law. Among suspicions of a “cash for votes” initiative within Congress to secure a positive vote on the judicial reforms, a new scandal broke out during the parliamentary debates when Elisa Carrió, an independent politician and Deputy for the centre-left party “Coalición Cívica ARI”, denounced a shady deal between the president of the Supreme Court Ricardo Lorenzetti and CFK. The pact would have allowed the Supreme Court to keep control over the Judiciary’s budget – which the judicial reform intended to put in the hands of the Executive – while the Supreme Court would have agreed not to move on a ruling against the Government over the restrictions on foreign currency transactions known as “cepo cambiario” (literally the “exchange clamp”) which are in force in Argentina. These measures limit significantly the rights of citizens to buy foreign currency and could be overturned by the Supreme Court on the grounds that they breach constitutional rights. If this were the case, the floodgates would open and the financial system would collapse under the weight of court rulings enabling the unhindered purchase of foreign currency, which the banks could not satisfy. Nobody knows yet what the bargaining with the Supreme Court actually entails. Some argue that the Supreme Court may have guaranteed a ruling against the Clarín Group, namely a court decision which declares as constitutional the articles of the Media Law which order the dismantling of the Clarín TV channels, the main conduits for opposition voices today. Either way, if they were proven to have occurred, these pacts could be punished as “treason” under article 29 of the Argentine Constitution. Among economic woes, the currency clamp and mounting corruption scandals, a number of public demonstrations summoned through social media have occupied the streets on different occasion since September 2012 and have increased the public’s rejection of the authoritarian ambitions of Kirchnerism. After Occupy Wall Street and the “Indignados” movement in Spain, it is evident that public demonstrations do not achieve tangible results, if they are not channelled through political parties with credible electoral aspirations. This is precisely the challenge Argentinean politicians face in the next few months. Otherwise, it is likely that the “Kirchner Empire” will overthrow any remnants of a constitutional democracy and remain in power for many years to come. Opinion polls show a sharp decline in CFK´s popularity in the last few weeks, although no alternative political figure is emerging. Peronism remains the hegemonic force in Argentine politics, under its different guises and has ruled the country almost without interruption since 1989. Peronism is not an ideology or a political party today. It is a well-oiled machine destined to cling to power, control trade, foster corruption and guarantee impunity for the unlawful enrichment of its politicians and their accomplices. As Nobel Laureate Mario Vargas Llosa once said: “Peronism is an error, and Argentines seem to persist in their mistake”. Only the Argentinian people have the responsibility and opportunity to correct it. Will they act on it? Originally published on MercoPress (see full online article).